For many in the Northwest, the Oregon Coast is a favorite vacation destination, and while the ocean is certainly a highlight of the getaway, it’s not the only one. A stop at Tillamook Cheese Factory can be just as memorable. After all, what is a vacation without delicious cheese? Tillamook has its roots in the 1850s, when local farmers took up raising dairy cows in the lush coastal area. Today’s Tillamook Cheese Factory still offers a nod to its beginnings with a schooner ship as its logo–that’s the Morning Star, Oregon’s first official ship that the dairy farmers used to move their products to Oregon as it was faster than going over land. Tillamook is known for many dairy products, from yogurt to cheese, but its cheddar cheese is one of the most popular items the factory puts out. And this delicious cheddar is also part of the company’s history, going back to 1894 when Peter McIntosh brought his cheddar recipe to the area and taught it to the local cheesemakers. This momentous happening led to the cheddar recipe still used to this day. By 1909, what was once a network of small, independent creameries began to change as several of the creameries joined forces to form the Tillamook County Creamery Association. This was the beginning of Tillamook as a brand and when things really started to take off. By 1947, Tillamook started making ice cream, and while they didn’t offer the range of flavors the company offers today, this was still a step in the right direction as Tillamook ice cream is some of the best you’ll find on grocery store shelves! In 1993, sour cream joined the party, in 1994 yogurt and their special three-year-aged vintage white extra sharp cheddar came along. 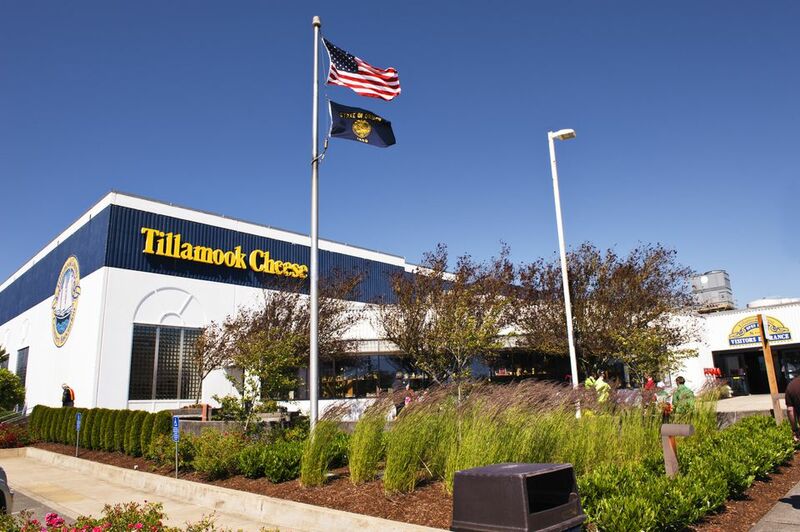 During its more than a century of creating some of the world’s tastiest dairy products, Tillamook has continued to add new products and win awards across the board. While it’s easy to find Tillamook at the grocery store, it’s even better to visit the source. For decades, Tillamook has had a visitor center where true cheese believers can learn more about how their favorite snack is created. In 2018, the company built an all-new, larger visitor center complete with the famous overhead view of the cheesemaking process. You can visit the store and café, and shop for cheese galore (often cheaper and in more variety than you’ll find at the grocery store), or enjoy breakfast or lunch in the café. For dessert, don’t miss the ice cream counter. If you’re not sure what to try, there are samples aplenty to help you figure things out. While the cheddar is popular, branch out. Tillamook makes all kinds of cheese you see less often in stores. Try the smoked black pepper white cheddar or some of the vintage white cheddar. The temporary visitors center also has lots of displays for you to learn about the cheesemaking process. Tours of the visitor center are free and self-guided. The Tillamook Cheese Factory is located at 4165 Highway 101 N., Tillamook, Oregon 97141. Many visitors stop by during visits to the Oregon Coast, as Highway 101 is the main gateway to the coastal cities. The visitors center is open every day except Thanksgiving and Christmas. The hours from early November to mid-June are 8 a.m. to 6 p.m. Monday through Friday, and 8 a.m. to 8 p.m. on Saturdays and Sundays. Summer hours are 8 a.m. to 8 p.m. daily.